Audi will drop the lowest-powered petrol and diesel versions of its TT from the line-up when an updated version of the two-door arrives in showrooms at the end of 2018. In a move that TT product marketing manager Jens Meier said will help to “simplify the range”, the car will come exclusively with the 2.0 TFSI engine. Although Audi has not officially linked the changes to WLTP, it is thought the more stringent procedure has encouraged the use of the 2.0-litre unit across the range. The 2.0 TDI had also experienced rapidly slowing sales, with the diesel model representing just 16% of the TT's overall UK sales in 2017. For the 2.0 TSI, three states of tune will be offered, with the first, the 40 TFSI, producing 194bhp, 16bhp more than outgoing 1.8-litre TFSI that features at the bottom of the current TT range. There will also be a 242bhp 45 TFSi, while the TTS (pictured above and below) gets 302bhp, a decrease of 4bhp thanks to the fitment of a new particulate filter. An Audi spokesman said that the resulting increase in back pressure has helped to boost torque, helping to shave a tenth from the pre-facelift car’s 4.6sec 0-62mph time. 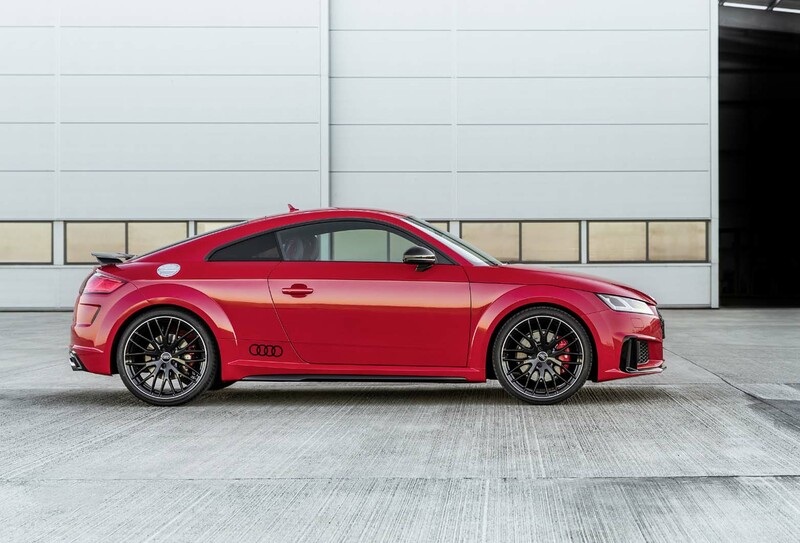 Fans of Audi Sport's version of the TT, the TT RS, will rejoice at news that it will stick with the current turbocharged five-cylinder motor. However, this updated performance model isn’t due to arrive until 2019, so we don’t yet know whether WLTP will affect the 394bhp output of its 2.5-litre engine. Along with its engine line-up changes, the tweaked third-generation TT, for which Britain has the biggest appetite in Europe, also now comes with more standard kit. Offered from the base level are Audi’s Drive Select system and automatic headlights and wipers. There’s also a new sports display for the standard Virtual Cockpit digital instrument cluster. Aesthetic changes are slim, but there is a new single-frame front grille and larger side air inlets on the bumper. S line models also get more aggressive styling, with new a new front splitter and a wider diffuser at the back. To mark the 20th anniversary of the TT, Audi is adding a special, limited-to-999 units TT 20 Years model to the range (above). It mimics the design and finish of the original TT concept, first shown in 1995, with grey paint, new 19in wheels and a tan leather interior. It will come exclusively with the TFSI 45 engine. UK prices for the updated TT are yet to be revealed, but the higher-specification base engine and extra standard kit are expected to encourage a rise in price. In Germany, it will cost from €35,000 (about £31,100) in coupé form. The roadster will start from €37,500 (£33,300). Hard to believe there was a profitable market for a small'ish sports car (generally doing low-med mileage) with the more expensive Diesel engine that was also noisey and heavier than the 1.8/2.0TFSI. Even more so in soft top form afterall how many diesel MX5's and Porsche Boxsters do you see? Still each to thier own or not as the case is now. ...how many diesel MX5's and Porsche Boxsters do you see? Donald Trump, we know your identity at last. Trying...very...and failing, as usual. One of the UK's most prolific failures. Mild amusement for some perhaps. Could there be something iffy with the TT RS Engine...still?